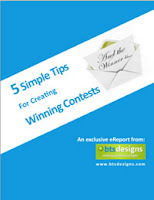 Behind The Screens Designs: Exclusive eReport: 5 Simple Tips For Creating Winning Contests! Exclusive eReport: 5 Simple Tips For Creating Winning Contests! Contests are a great way to grow your audience and develop stronger relationships with current customers. Discover 5 simple tips that will help to make sure you and your customers are get the most from your contests. Get your free eReport now! social networks and direct email, which directed 210% more traffic in 2012 than in 2011.